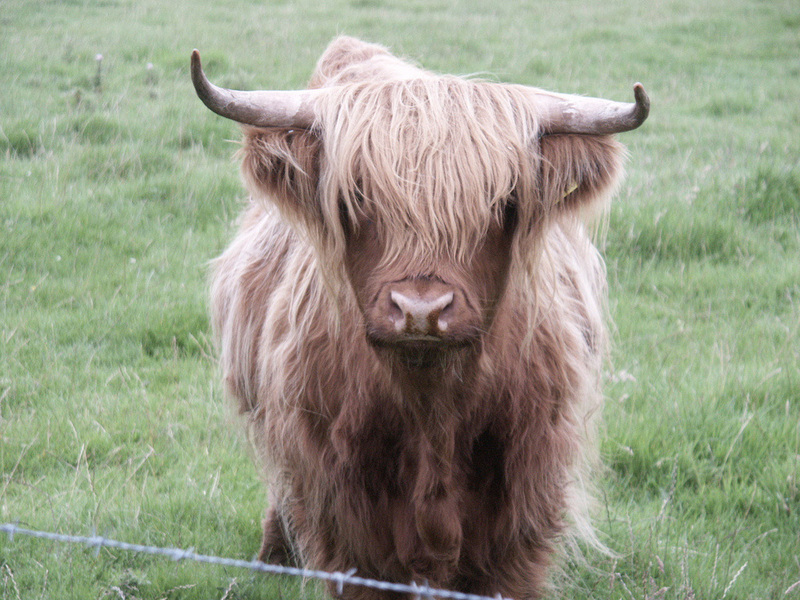 Gaelic name is "Beul an Àtha" meaning "mouth of the ford". The ford or bridge is over the River Sorn. The village of Kilarrow was close to Islay House, but the then owner of Islay, Daniel Campbell, wanted to extend his gardens and grounds around the house. From 1768 he planned the construction of the village that is now Bowmore to rehouse the former residents of Kilarrow. Bridgend is mainly on the other (Bowmore) side of the Sorn. 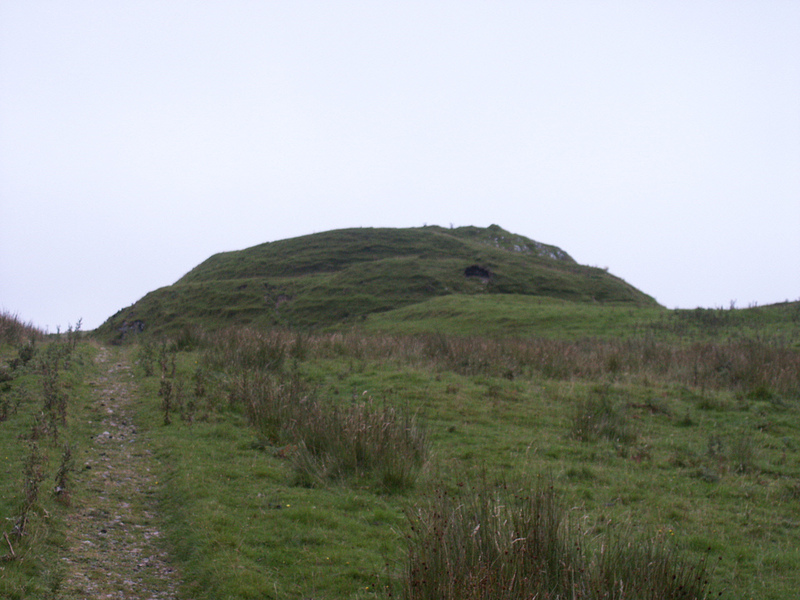 Islay has about 80 hill forts dating back to at least the Iron Age, one of the most impressive remains is Dun Nosebridge near Mulindry, close to where the road from Bridgend meets the Glen Road, and overlooking the River Laggan - in a very strategic position with good views over much of the surrounding area. The Islay House Community Garden, formerly the kitchen garden for the House was leased to the Community in 2005. Islay House Square - formerly stables and estate workers' houses now has a few shops and businesses, including Islay's only brewery, Islay Ales, which like Islay's distilleries is open to the public. Bridgend's only whisky connection is the Hotel which has a reasonable range of malts in its bars. Not sure if the shop sells much whisky. But Bowmore is only three miles away. 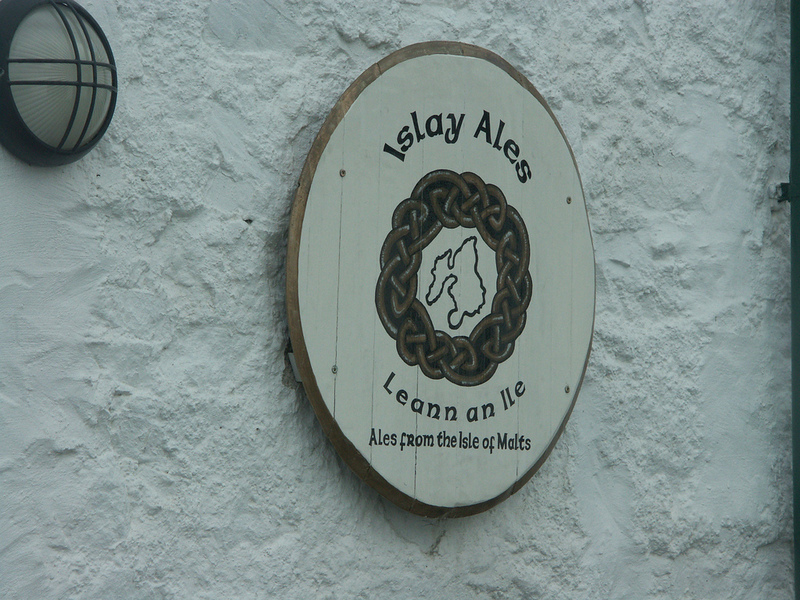 And Islay Ales have used the wort from a number of Islay distilleries from time to time. Bridgend holds a central position on the island and is the junction of the two A roads on Islay. It's also at the head of Loch Indaal, and the location of the former Laird's House - Islay House. 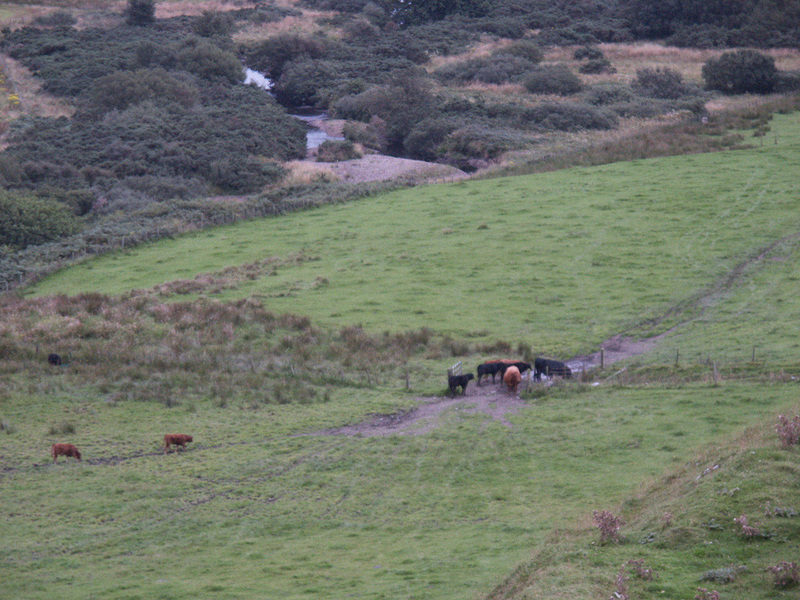 A more substantial settlement, Kilarrow was in the area, see below left. 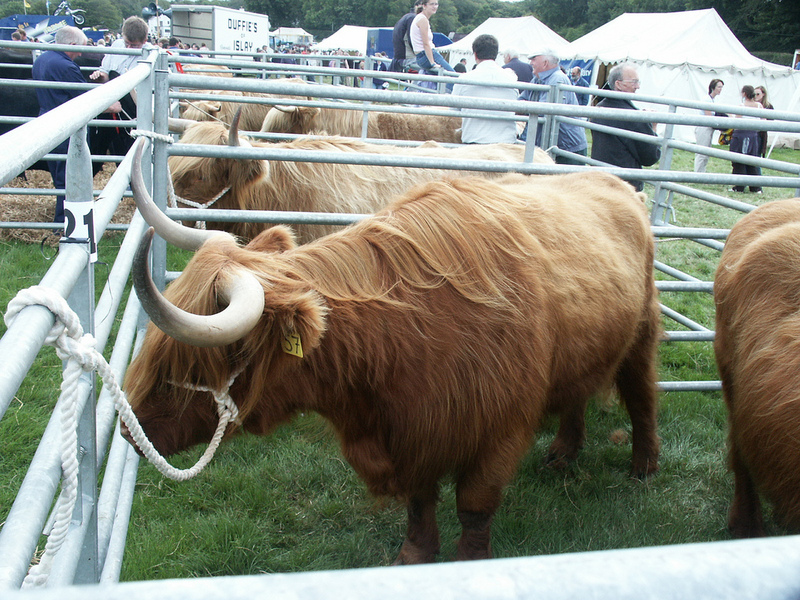 The annual Islay Show is also held in the grounds of Islay House. I attended the Show in 2003 as all the distilleries were closed for the day! Bridgend is slightly nearer the northern of Islay's two ferry ports - Port Askaig (8 miles), but Port Ellen is only 11 miles via the High Road, Both are served by CalMac from Kennacraig Winter Summer. Getting to Kennacraig? - see main Islay page. There's also one or two sailings a week to/from Oban Winter/Summer using Port Askaig). I've not stayed in any of the above. On my first visit to Islay, I stayed at a B&B in Mulindry run by one of the Bowmore butchers (er no, that's not what it sounds like - they also ran a butcher's shop in Bowmore), but it's no longer a B&B, and there's no others out that way. 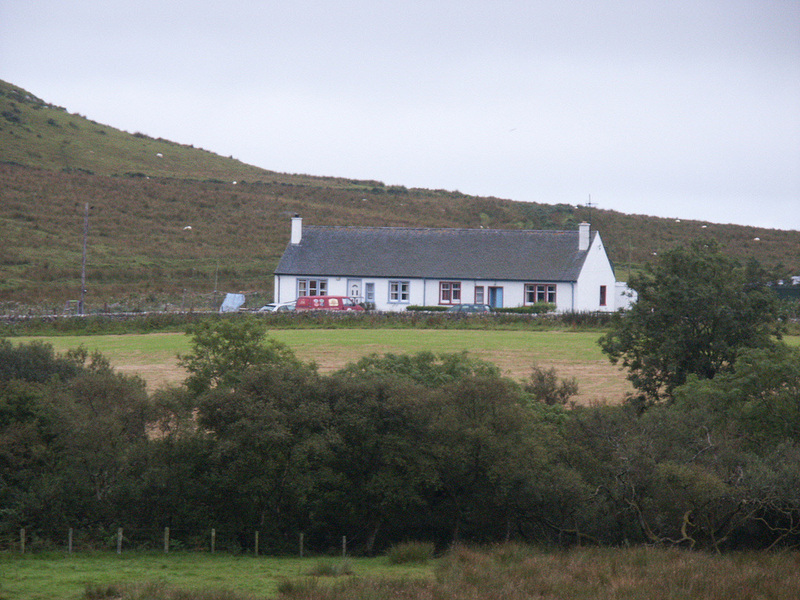 Sornbank, Lyrabus, Loch Gruinart House all offer Self Catering accommodation as well. 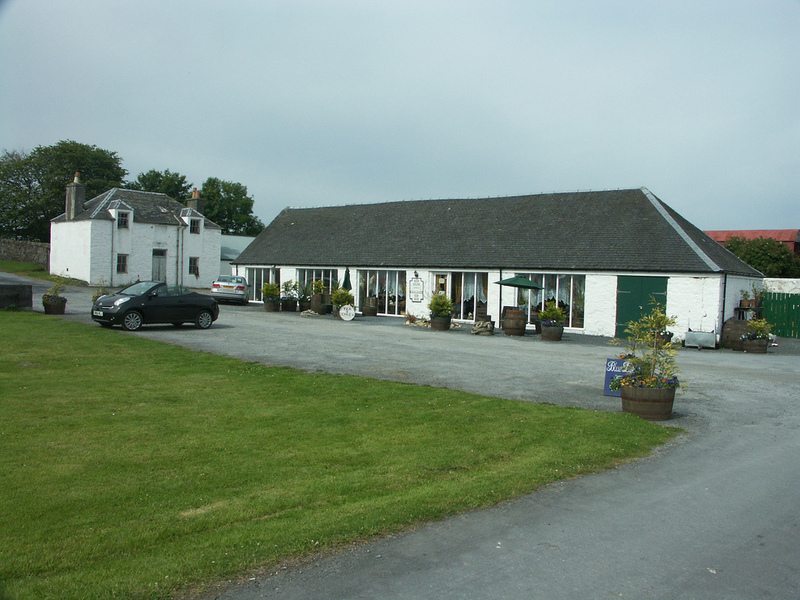 Several other Self-Catering options - see list on Islay Info. Bike hire from Bowmore Post Office 01496 810366; Port Ellen 01496 302349.and Islay Cyces as above; Port Charlotte 01496 850488; and Port Askaig (Persabus) 01496 840753. Mon to Sat, Thurs & Sat am only. Banking (Bowmore) - RBS, Main Street; BoS, Shore Street. Cash Machines at both.